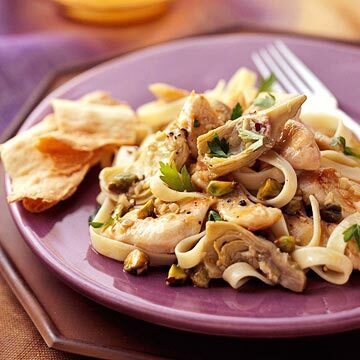 This 30-minute dinner includes a sauce made with artichoke hearts, pistachios and wine. It's served with chicken and pasta to make a complete meal. Meanwhile, cut chicken into bite-size strips. In a very large skillet, cook chicken in hot oil over medium-high heat for 3 to 4 minutes or until chicken is no longer pink. Remove chicken from skillet with a slotted spoon; discard pan drippings. In same skillet, melt butter over medium heat. Add garlic; cook and stir for 15 seconds. Remove from heat. Add artichokes, pistachios and wine. Return to heat. Bring to boiling; reduce heat. Simmer, uncovered, 5 minutes. Stir in salt. Return chicken to the skillet. Cook for 1 to 2 minutes more or until heated through. To serve, arrange the pasta on 4 individual dinner plates or a large platter. Spoon the chicken mixture over the pasta. Sprinkle with parsley and cracked black pepper to taste. Serve immediately. Makes 4 servings.